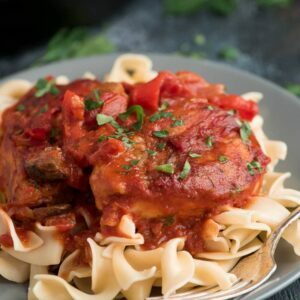 Enjoy a lean version of your favorite 'hunter-style' chicken in this Chicken Cacciatore with mushrooms, onions, and red bell pepper. Sprinkle both sides of chicken with salt and pepper and then dredge in the flour. Brown chicken for 2-3 minutes on each side until golden. Set aside on a plate. Add the mushrooms to the skillet and cook for 5-8 minutes until browned. Then, add the onion, bell pepper, and cook for another 5 minutes or until they begin to soften. Add the garlic and cook another minute. Pour in the wine and bring to a simmer. Add the broth, crushed tomatoes, diced tomatoes, and all the spices. Bring to a simmer, add the chicken, spoon a little of the sauce over the tops and then place the pan in the oven. Cook for 35-45 minutes until internal chicken temperature is 165 degrees. Sprinkle with chopped parsley and serve over pasta or rice.